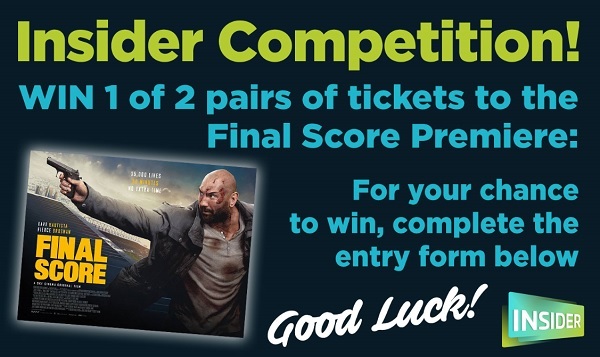 To celebrate the release of Final Score, we have 2 pairs of tickets to give away to the Premiere! Two lucky Insider members, plus a guest each, will be living like the stars for a one night as they walk the red carpet at the London Premiere Screening on Thursday 30 August 2018. The winners will be notified by email on Tuesday 28 August so please check your mailbox to see if you have been chosen! Your full name: Please enter your name. A group of heavily armed criminals take control of a stadium packed with 35,000 football fans. 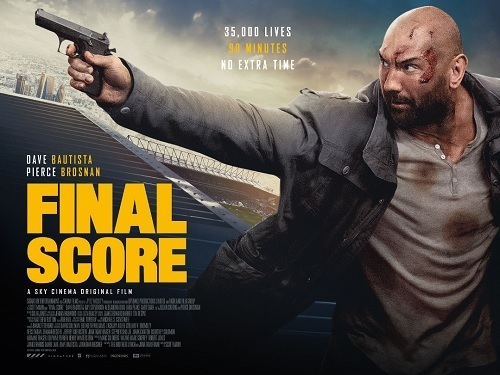 Ex-soldier Michael Knox (Dave Bautista) is forced to use skills from his military background and everything at his disposal to save the spectators, including the life of a fallen comrade's daughter. 1. This promotion is open to residents of the UK only. 3. By entering the prize draw, entrants agree to be bound by any other requirements set out on this website. Entry is only available online. No responsibility can be accepted for entries not received, only partially received or delayed for whatever reason. Paper entries are not valid. 4. Entries that are incomplete will be deemed invalid. 6. No responsibility will be accepted for entries lost, delayed or damaged in transmission. 7. There is one entry per person. 8. Competition closes on Monday 27 August, 2018, at midnight GMT. Entries received after this time and date will not be entered into the draw. Competition winners will be contacted on Tuesday 28 August and will have 48 hours to respond to confirm their attendance. Failure to respond within this time will result in another prize winner being selected. 9. Prize details are accurate at the time of print; the promoter reserves the right to substitute the prize for one of greater or equal value. 10. The decision of the promoter in all matters is final and binding. 11. Employees of Showcase Cinemas/Showcase Cinema de Lux/NATL. Amusements (UK) Ltd. Altitude, their agents and their families, and anyone else professionally connected with this promotion are excluded from entering this competition. 12. The Promoter reserves the right to withdraw the promotion due to circumstances beyond its control. 13. Neither Showcase Cinemas/Showcase Cinema de Lux/NATL. Amusements (UK) Ltd. nor Altitude or any other respective agents involved with this promotion shall be liable for any failure that is caused by something outside its reasonable control. 14. Transport is not included in the prize and winners must make their own way to and from the screening.